Photos of the 2008 10k Road Race runners. Photos of the 2007 Scarecrows, Parade and more. The 2015 Annual Wray Village Scarecrow Festival ran from Saturday 25th April to Monday 4th May. Attractions included the 10k road race, Car Boot Sale, Giant Scarecrow Parade, Vintage Market and Classic Car Show, Fun Fair plus much more. The 2013 Annual Wray Village Scarecrow Festival ran from Saturday 27th April until Monday 6th May. Take a look at some of the Wray Scarecrows in the village 2013. Wray Village Scarecrow Parade video - Giants parade through the village 2013. A number of beautiful old buildings survive in Wray that were built in the 17th and 18th centuries, these can be identified by the datestones set into their frontages. Wray is a small settlement, which in the 19th century was a centre of hat, nail and bobbin production. The Village boasts a Post Office and General Store, 2 Pubs (one open and one closed! ), The George and Dragon on Main Street and the Inn at Wray on Hornby Road (currently closed - Spring 2013), a Tea Rooms Cafe at Bridge House Farm, a Garden Centre & Shop and of course the beautiful scenery and walks which surround the Village. 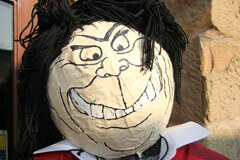 Photographs - you can view photos of the Scarecrows 2007, 2006 , Giants Parade and Runners online. Wray Village Tour - click on any of the thumbnail images below to start your tour of the Village, or select a location from the Map of Wray. 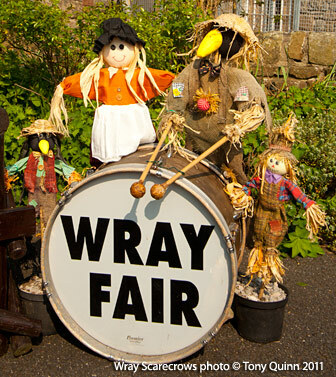 Thousands of visitors fill the streets of the village throughout the week to view the scarecrows, and then visit the May Day Wray Fair. A flash flood of incredible speed and ferocity in the river Roeburn left a trail of destruction that resulted in the loss of houses, bridges, livestock, vehicles, and personal possessions. Remarkably, despite the scale of the devastation caused by the flood, no serious injury was done to any of the the people of the village. The local significance of the Flood of 1967 is illustrated in the Millennium Mosaic, completed in September 2000, which represents the wind and storm spewing out a great tide of water. 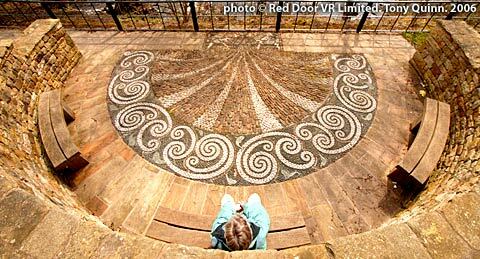 The Mosaic is sited in the 'Flood Garden' on Main Street, the site of some of the houses demolished as a result of the flood. Visitors to Wray virtual tour.